Hardly anything is known about the 40 years the Hebrews (Israelites) were wandering in the wilderness. Recent archaeogical finds give some idea of where they were for part of that time, but there are few writings that tell us yes, so and so happened right here. Only toward the end of their 40 years of wandering do we get much detail about places and connected events. Here is a wonderful old map that you can click on and enlarge. Unfortunately it is not in English, and it might or might not be accurate. But it is very beautiful, and you probably can identify some of the places. Last time we looked at the disaster instigated by Korah. Somewhat south of the Red Sea crossing there was actually a place named Korah. Admittedly Korah is a fairly common name in the middle east. 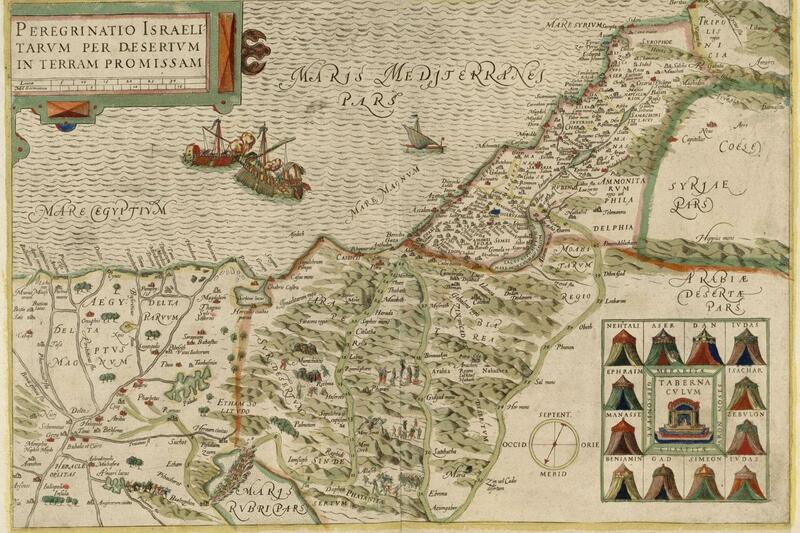 However, besides Korah, other Jewish place names were recently found on an ancient map of Saudi Arabia. These Jewish place names appear outside the boundaries of what we thought was the route of the Hebrews’ wanderings. I believe the Bible gives us a hint. When God was discussing with Moses the 40 year penalty he said to Moses: Tomorrow turn you, and get you into the wilderness by the way of the Red Sea. (Numbers 14:25) He was sending them back in the direction they had come, toward the Red Sea and the country of Arabia. A couple of chapters later the Korah incident is recorded. Were the children of Israel that far into Arabia when this took place? We can only guess for real information is scarce. An American couple, Jim and Penny Caldwell, did a lot of exploring in Saudi Arabia some years ago and their findings shed some light on the Hebrews and their experiences in the Arabian desert. You can find them on You Tube. Forty years, during which Moses and the Hebrew children had to be somewhere…. Some folks would have us think they walked round and round Mt. Seir for 40 years………that is really difficult for me to believe. There is an interesting incident recorded in Numbers very soon after the command to go by way of the Red Sea and that is the attack by the fiery serpents. Again, the group was complaining of hardship and wishing they had never come to this land. The text says God sent fiery serpents among them and the serpents bit them and they died. Moses prayed for the people and God gave him the remedy: make a serpent of brass and put it on a pole. Whoever is bitten will be healed upon looking at the brazen serpent on the pole. Here is an illustration of the Greek rod of Asclepius, the god of medicine and healing. Where do you think the Greeks got their symbol? Where were the fiery serpents? Probably near the head of the Gulf of Acaba (the Red Sea). Poisonous snakes bearing red spots have been found there. Balaam bid the Midianites to stay overnight, saying he would let them know in the morning what he would do. That night the Lord spoke to Balaam and told him not to go and not to curse Israel because he (God) had blessed them. The next morning Balaam told his visitors he would not go with them so they went back alone. But King Balak was undaunted. Soon he sent men more honorable than the first to persuade Balaam to come and curse the Hebrews. Balaam told these that if the king gave his house full of silver and gold he could not say more than the Lord allowed him to say. That night the Lord told Balaam that if the men came for him to rise up and go with them. Nevertheless, he was to prophesy only that which the Lord gave him. The next thing we know is that Balaam has saddled his donkey as is on his way. Did Balaam set out before the men came for him? We don’t know, but we do know the Lord was angry about something because he sent an angel (the Angel of the Lord) to stop Balaam in the way. The little donkey saw the angel and began behaving strangely and finally refused to go another step, though Balaam beat her. Then the donkey spoke to Balaam and asked him why he had beaten her and had she not always been obedient before. When she said this Balaam realized something was amis. 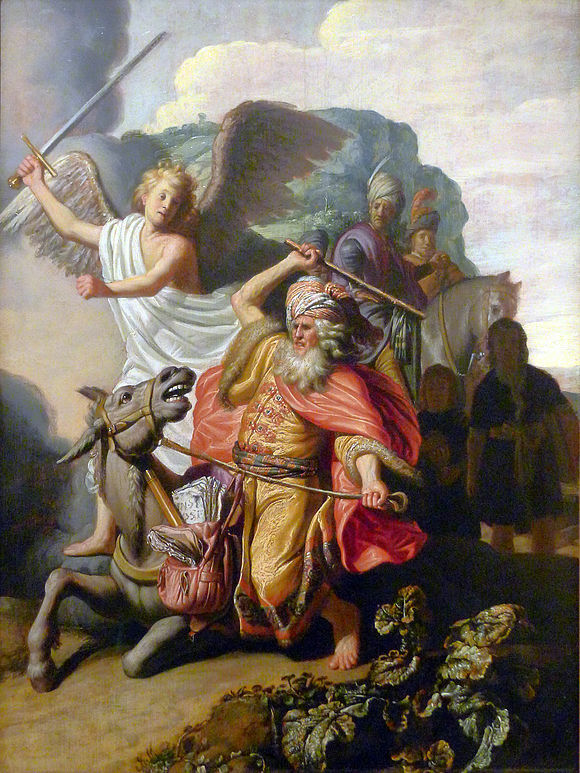 His eyes were then opened to see the Angel of the Lord, with a great sword drawn, who said to him, “If your donkey hadn’t turned from me three times, by now I would have killed you!” (Numbers 22:33 paraphrase) Balaam was about to go back home, but the Angel told him to go, but to speak only what he Lord told him to say. King Balak was not very pleased of course, for Balaam had only spoken favorably concerning the Hebrews, but he did not give up. He wanted Balaam to go to another place, where only a small portion of the Hebrews could be seen. There, he reasoned to himself, Balaam might be more amenable to cursing them. There he offered his seven sacrifices, and the Lord gave Balaam another word of blessing upon the Israelites. After this Balaam went back home and the Hebrews continued their encampment. Balaam had done what the Lord told him. He had given the word exactly as it was given to him. But, Balaam goes down in history as a false prophet. Why? if he was obedient to do what God told him? The best answer is given in Revelation 2 where is recorded the letter that Jesus dictated to John to be sent to the church at Pergamos. Balaam was not able to curse Israel, but he was aware that their blessings stemmed from their obedience to God. Though from time to time there had been much disobedience, Moses had always reined in the troublemakers and meted out discipline. The thing that Balaam did was to suggest to King Balak that if he could get Israel to sin and become disobedient to God, then Israel’s blessings would cease and trouble would come upon them. Soon enough this very thing happened. The people of Israel began to join the people of Moab in the worship of Baal and began commiting whoredoms with the daughters of Moab. No doubt King Balak was behind this. We already know the Hebrews could be drawn into sin with very little provocation. It probably wasn’t too hard for the Moabite women to entice the men of Israel to participate in their heathen rituals in honor of their god Baal. In retaliation for this God sent a plague on the Hebrew people. Then one of the Hebrew men had the nerve to bring a Midianite (Moabite) woman into the camp. The two were promptly killed and that ended the plague. Altogether 24,000 people died as a result of this disobedience. There is too much left of the story of the Hebrews’ journey to the promised land to finish here. We are up into the region of present day Jordan now. One more post and we will be into the promised land!